In an attempt to beat the crowds that would inevitably follow on a day that was forecast to be sunny and nice, I left my home in Provo just after 6 AM and arrived at the trailhead at about 7 AM. When I arrived, there were about a half dozen vehicles or so with a group gearing up for some skiiing. 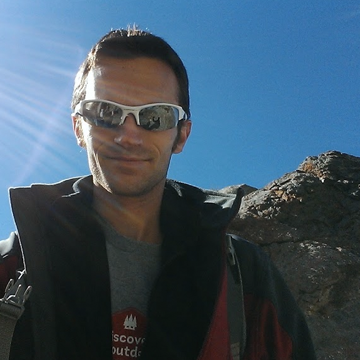 I grabbed my stuff, put on my spikes and began the 3 mile hike up 2700 feet to Lake Blanche. A little over halfway up I reached a little clearing where I got my first glimpse at Sundial peak. Sundial Peak is probably what makes Lake Blanche such a popular hike because it's a very prominent peak that gives Lake Blanche a beautiful and majestic backdrop. If I were to guess, I'd say it may well be one of the top 5 landmarks photographed in the Wasatch. Another prominent peak that became visible which lies west of Sundial is Dromedary Peak. 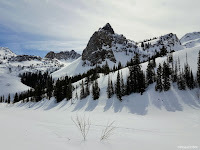 After a little over another mile, I was finally at the edge of Lake Blanche looking up on Sundial Peak in its fullness. I sat down for a snack with nobody else in sight. Despite cloudy, gloomy, and windy skies, it was all still a beautiful site. I had only encountered one group of people on my way up, a small group of trail runners who had passed me up and had already turned back and passed me by once more on their way back shortly before I arrived at the lake. 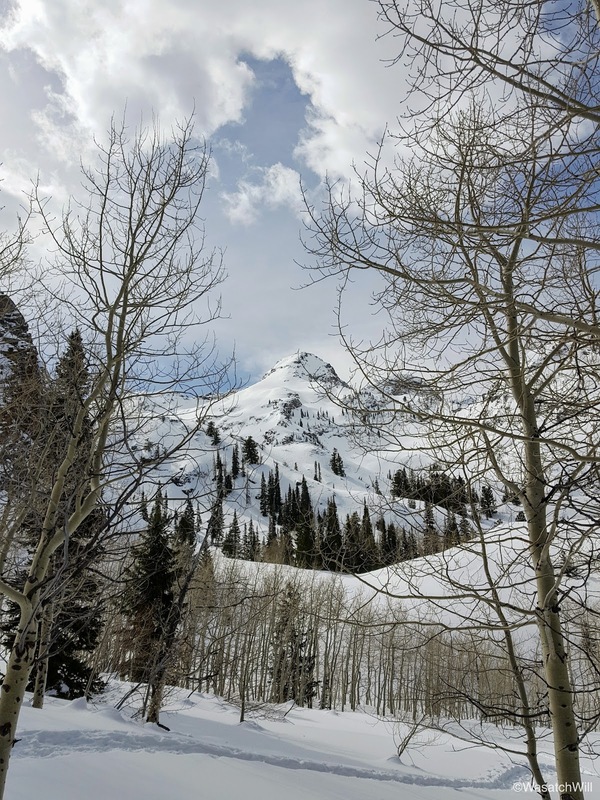 Not long after sitting down however, another small group of backcountry skiers passed through and skinned their way up into the upper basin to the east of Sundial Peak. They disappeared about as quick as they appeared. From then on, I encountered nobody else in the time I'd spend around the lake. Even with such high winds blowing through the bowl and pounding the whole area, I decided to linger around. 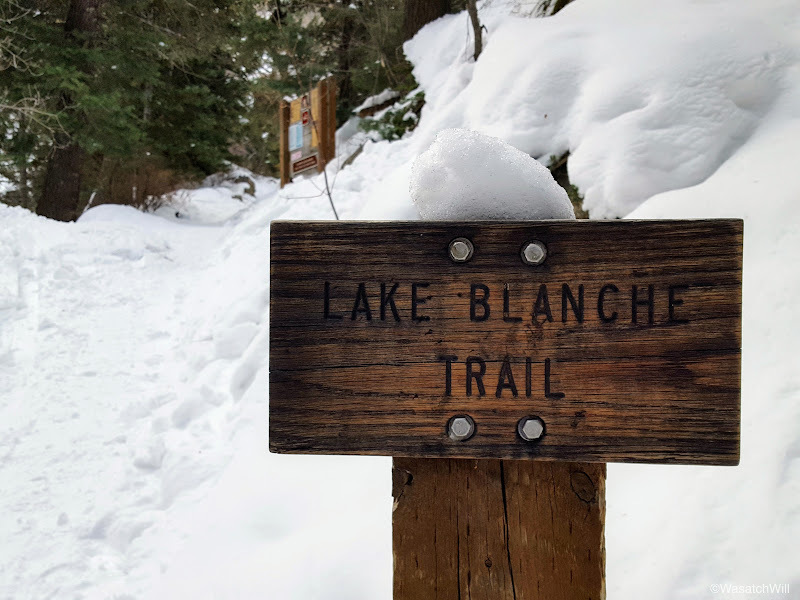 I swapped out my spikes for my snowshoes and set off to traverse across the surrounding terrain to the west and see if I couldn't locate Blanche's sister lakes, Lake Florence and Lake Lillian. In short course, I was able to reach a point where I could get a view down to Lake Florence and Lake Lillian. From there, I descended down to the Lake Blanche dam and snowshoed across it back to the east. Wishing I could stay longer, the wind was really beating me up and so I said farewell and began to make my way back down. Still enchanted by the constantly changing clouds and lighting, I could not resist the urge to snap a few last pictures of Sundial as I looked back. I can now fully understand the popularity of this area. It was like love at first site and saying goodbye was hard to do, even in the bitter cold wind. Resigned to look forward to another time when I could return later in the summer, I refocused on getting back down the trail. 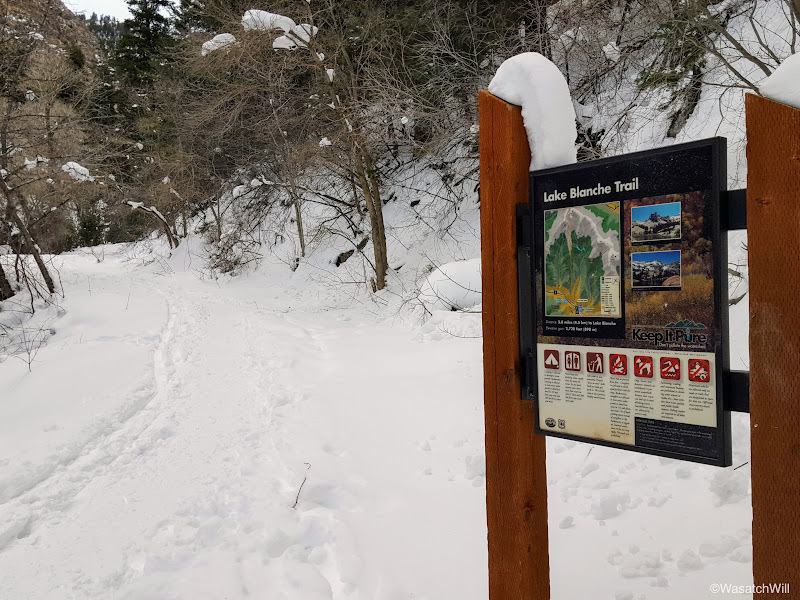 I pulled off my snowshoes and put back on my spikes for the descent back down to the trailhead. All along the way down, as anticipated, I'd pass by at least a dozen different groups that all together would have comprised at least 50 people. Once back at the trailhead, I was astonished to find that the half dozen cars that were parked along the road when I arrived had now grown to at least 30 to 40 and likely more. 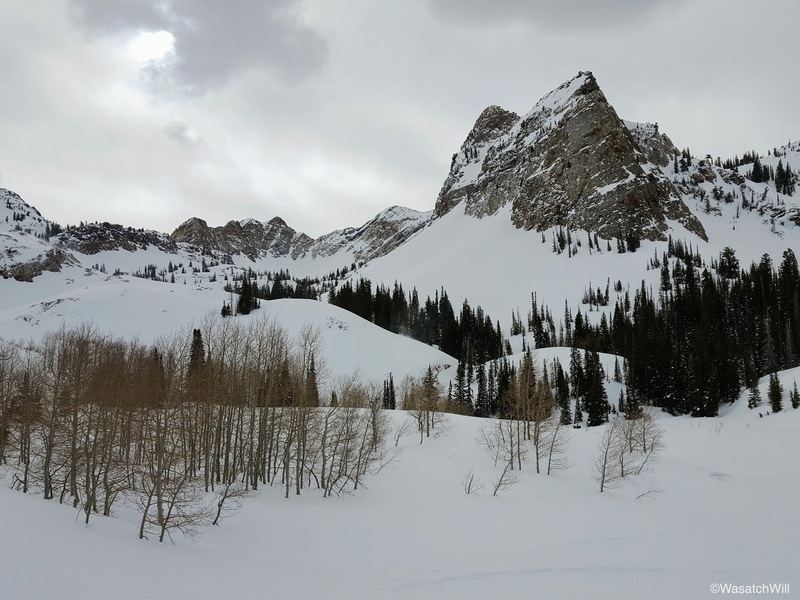 Granted, there are other trails and backcountry routes for skiers in the the same vicinity, so not all were certainly destined for Lake Blanche. Still, I was grateful I had sacrificed an opportunity to sleep in and come up as early as I did. I pulled off my spikes and put my stuff up in my car, then made a short walk up the road and then off over to Hidden Falls for a few moments before returning back to my car for good. 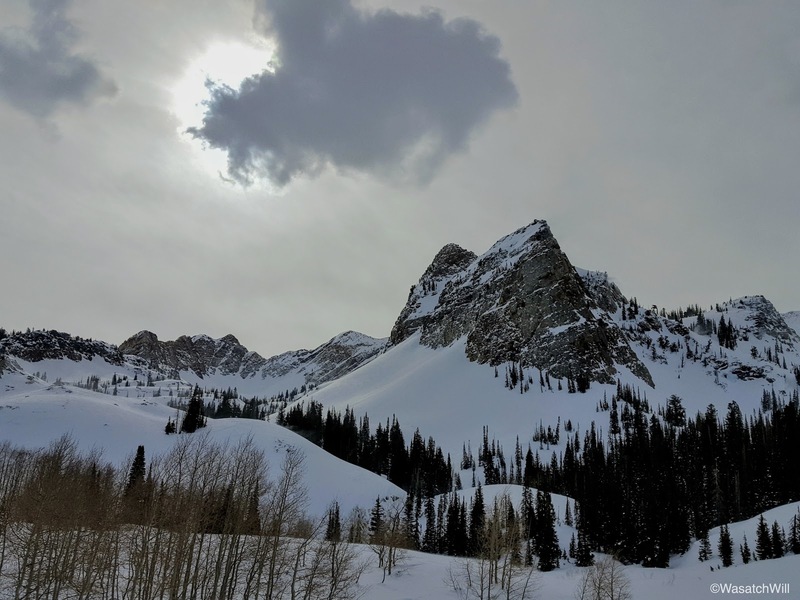 I definitely hope to make a return trip to Lake Blanche, perhaps even as an overnighter this summer, even with the crowds the area regularly sees. 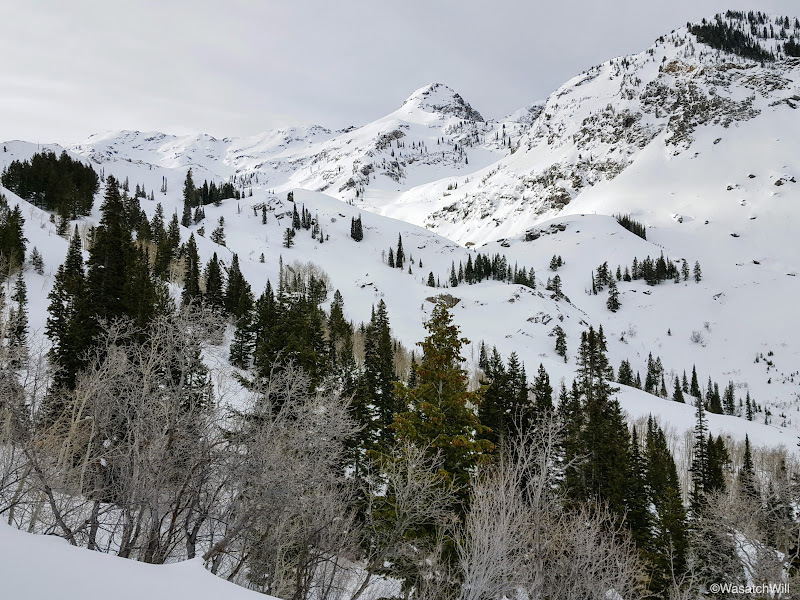 Like a number of other Wasatch jewels, it is indeed a magnificent little basin.